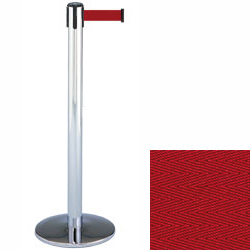 This chrome stanchion with maroon belt reaches to 7.5' and the design discourages children from ducking underneath to an exhibit or ticket register. Space these barriers 7 feet apart for the best results. No better posts can be found on the internet (we've done the research!) 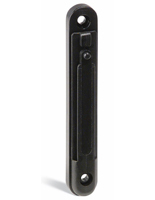 This stanchion with maroon belt meets automotive quality standards; it's been tested more than 250,000 cycles. Retractable system dimensions are 38"H, 13.5"D (base), 24 lbs; with a 2" wide belting. 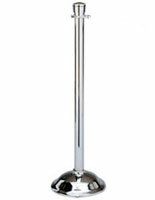 Buy this stanchion with maroon belt in chrome for effective wayfinding and line queueing, and ask about quick shipping! For your higher traffic areas, we recommend using Dual Belt Posts. Discourage ducking underneath! For assistance and to learn about layout options, click designing crowd control systems.